Having taken part in Small Business Saturday from its inception, we value the contribution it makes in highlighting the diverse and valuable role small businesses play in the economy and communities. Now in its fifth year in the UK, Small Business Saturday will promote one of the Small Biz 100 businesses each day on social media, in the run-up to its annual event on Saturday 2 December, 2017. Small Business Saturday was introduced to encourage spending with small, independent firms and is seen as the antithesis to Black Friday and Cyber Monday, which predominantly benefit larger stores in the run-up to Christmas. 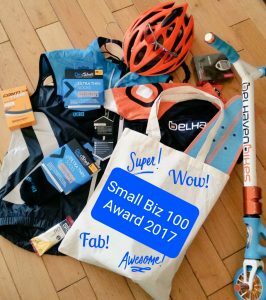 “We are honoured to be chosen to be part of ‘Small Biz 100’. Many thanks to everyone who shares their cycling, skateboarding and scootering adventures with us. We value your support very much”. Check out our Christmas and Small Business Saturday offers in our News item. Call us on 01368 860300, email [email protected] , connect on Twitter or pop into the shop.